Officially licensed Major League Baseball (MLB) team neon sign. 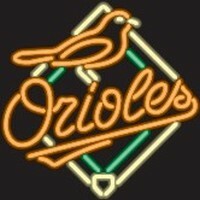 Hang up this Baltimore Orioles neon in your game room, bar or business to show your team pride. Let everyone know who the number one team is with brilliant neon. Go Orioles! Solid state transformer backed by full 3-year warranty. Sign is a 100% hand crafted, with quality 1/2" diameter neon glass tube. Mounted on plastic.